The Late Late Show with James Corden has only been on the air for just over six months, but in that short amount of time, new host James Corden has given movie fans a new reason to tune in, aside from interviews with the biggest stars. The host has a running segment entitled Role Call, where his guests such as Tom Hanks and Arnold Schwarzenegger act out all of their biggest hits (and some of their flops) in a short amount of time. Last night, Matt Damon stopped by the late night program to promote his sci-fi drama The Martian, in theaters October 2, where he became the latest star to act out his entire film career in just eight short minutes. With the help of some CGI backdrops, props and a string of bizarre costumes, Matt Damon and James Corden played out a number of rapid-fire scenes, starting with Good Will Hunting, School Ties and hilarious renditions of Ocean's Eleven, Ocean's Twelve, Ocean's Thirteen, where they both hold up cardboard cutouts of his numerous A-list co-stars. The poker classic Rounders followed along with Happy Feet Two, Saving Private Ryan, Invictus and even a bizarre plug for The Martian, where James Corden plays an actual martian. Any discussion of the actor's filmography includes his blockbuster Jason Bourne franchise, and this video is no different, with Matt Damon punching through the entire trilogy, The Bourne Identity, The Bourne Supremacy and The Bourne Ultimatum, in a matter of seconds. A number of stuffed animals provided some assistance for We Bought a Zoo, although James Corden couldn't quite master the burger-catching skills from Stuck On You. The hilarious segment ended with re-enactments of Behind the Candelabra, Contagion, The Informant!, The Adjustment Bureau, True Grit, The Legend of Bagger Vance, The Departed and The Talented Mr. Ripley. James Corden kicked off this regular segment during his first episode in late March, where Tom Hanks and the late-night host breezed through his biggest hits in just six minutes. With the number of costume changes and props involved, it's rather impressive how the whole thing turns out. Arnold Schwarzenegger also appeared on the show back in May, re-enacting classics like Twins, Conan the Barbarian, Total Recall, Batman & Robin and, of course, The Terminator. 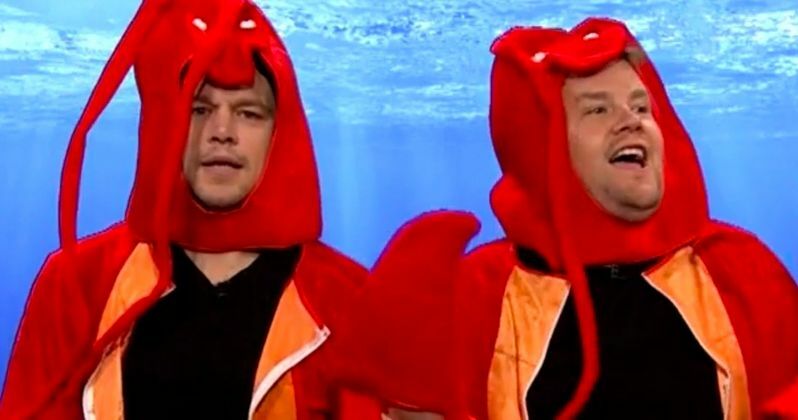 While we wait to see whose career James Corden showcases on his next Role Call segment, take a look at last night's hilarious video with Matt Damon. Are there any movies they missed that you wanted to see in this segment What actor or actress do you think would be a great fit for James Corden's Role Call? Let us know what you think after checking out this eight-minute video.